This plate is just offered on ebay. In my eyes it is a fake. Be careful. I enclose a photo of the ebay plate and a photo from his visit from a newspaper. Compare yourself. This entry was posted on Friday, January 22nd, 2016 at 7:56 am and is filed under FAKE plate, Uncategorized, Vatican. You can follow any responses to this entry through the RSS 2.0 feed. You can leave a response, or trackback from your own site. 2 Responses to Fake Pope plate ? It certainly is a fake. 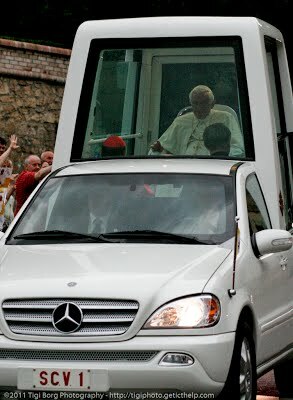 It has no fixing holes, differs from the plate format used by the Vatican State on the Mercedes popemobile and, if they had a back up vehicle and spare plates, would have been taken back to Rome at the end of the visit.